Is Tom Steyer Reconsidering A Run? While Tom Steyer announced back in January that he would not make a presidential run in 2020, a poll going around Iowa raises new questions on whether he might be reconsidering that option. A Starting Line reader received a polling call yesterday afternoon in which various messages on a possible Steyer candidacy were tested. 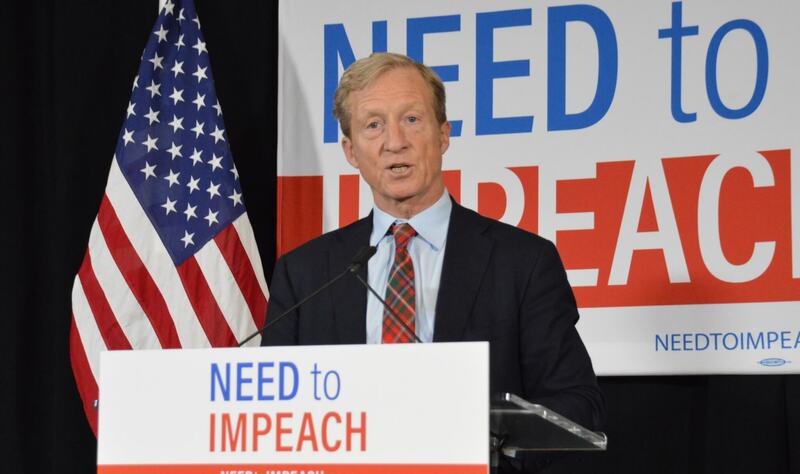 Steyer has spent the past several campaign cycles leading his NextGen Climate organization and, more recently, his Need To Impeach effort. He had built out extensive political operations in Iowa with those two groups, although many of the staff involved in those efforts have since signed on to other presidential campaigns. But with an unsettled field with no clear front-runner, Steyer could still jump right in, starting out with a large financial advantage and a massive email list. Which one or two of the policies I just listed would you consider most important in your mind? On the issue of climate change, how would you rank the issue of climate change? Which of the following statements come closer to your view? In 2020, Democrats should nominate a candidate for president with a lot of experience in Washington because right now we need someone who knows how to run government and get things back on track. Should the Democratic candidates openly talk about impeaching Donald Trump or not? Mention elected officials or public figures, what is your opinion of them? If the Iowa Democratic caucuses were held today, who would you support? If the Iowa Democratic caucuses were held today and the following candidates were in the race, who would you support? Describing Tom Steyer (spelled out Steyer) is a philanthropist who left the business world to fight for a more sustainable, just and fair America. He believes the American people working together can “reverse the hostile corporate takeover of the American government” that has rigged the system. Steyer founded NextGen, a progressive organization to combat climate change, promote social justice work, and underrepresented people so they can have a voice in our democracy. Steyer is a forceful opponent of Trump, started Need to Impeach, which grew into the country’s largest political movements with 7.5 million members. Steyer and his two grass roots organizations had a major impact on beating Trump in the congressional elections. Steyer says we must change the corrupt political system that values money over people and reward politicians who look out for their own jobs and corporate donors. Steyer believes we need bold changes for Washington to serve the people, not corporate interests and their wealthy allies. Steyer says Americans need a 21st century bill of rights, guaranteeing the right to an equal vote, clean air and water, right to lean, right to earn a living wage, and the right to health. Steyer, age 61, a billionaire, was an early signer of the giving pledge to donate the bulk of his fortune to charitable causes during his life time. Is your reaction to Tom Steyer, a potential presidential candidate? Now that you have more information, would you consider him for the presidency? Critics of Tom Steyer say there are already enough qualified candidates running for president and we do not need a wealthy billionaire trying to buy into the race. They say Steyer would do more good by continuing to give to progressive causes and candidates instead of getting into the race himself. Supporters of Steyer say even though all of the candidates in the race say they will take on trump, Steyer was the only one with the courage to stand up to Trump and publicly call for Trumps impeachment. They say Steyer is the only one we can trust to take action on our principles and do the right thing.